The Roof Gardens, among the earliest in England, were built for the new Derry and Toms Department Store, which opened in 1933. The Gardens were conceived by Vice-President of Barkers Trevor Bowen, who employed landscape architect Ralph Handcock to realise his vision and comprised 3 gardens from the outset: Spanish Garden, English Woodland Garden and Tudor Courtyard. Opened in May 1938 by the Earl of Athlone, the gardens became a popular attraction. 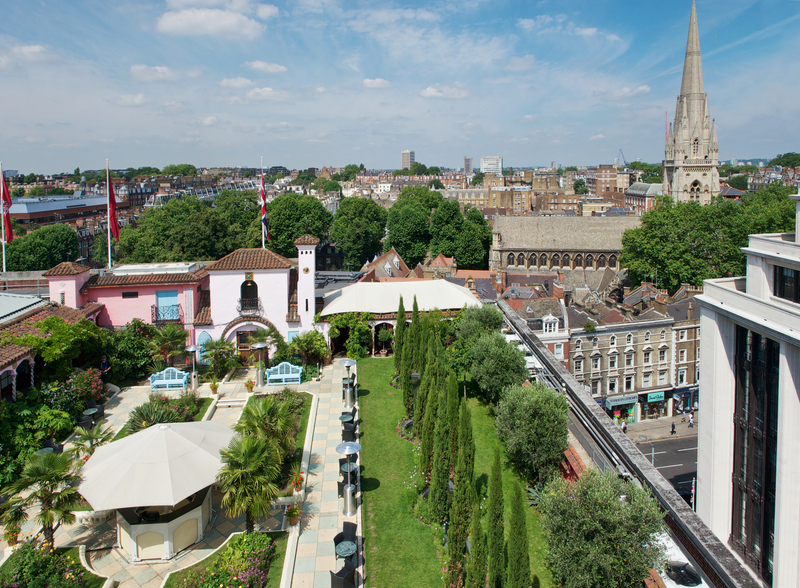 Owned by Biba in the 1970s, and by Richard Branson since 1982, the Gardens are now part of Virgin Limited Edition and host a members' club, a private function venue and, since 2001, the Babylon Restaurant on the 7th floor, which overlooks the gardens. They were extensively replanted in 2008/9 and are still home to exotic wildfowl including pink flamingos. The Spanish Garden is now planted in the style of the 1950s, while the Tudor Courtyard is based on the Biba ethos and planting from the 1970s. The English Woodland is being managed as a C21st environmental and wildlife garden. Has taken part in Open Garden Squares Weekend 12 times, most recently in 2017. Babylon Restaurant open daily for lunch, Mon-Sat for dinner. Events space in the Club House and Members Nightclub on Fri & Sat nights. Derry and Toms was one of Kensington's early department stores, along with Barkers. In c.1869 Charles Derry and Charles Toms went into partnership and took a number of plots of land in the Kensington Improvement Scheme west of King Street and, like that of John Barker, which started out as a small draper's in 1870, their business expanded rapidly, acquiring more and more premises along the High Street. In 1920 following the post WWI slump when the business suffered, Derry and Toms merged with Barkers Department Store. After much negotiation with the authorities and also with residents of nearby Kensington Square (q.v. ), a new Derry and Toms store was built in 1929-31 designed by Bernard George, with floor layouts by American architect C A Wheeler. Six years after the store was completed, the roof gardens were created, the building having already allowed for this with a thick bitumastic base, layer of brick and rubble, fan-shaped drainage system and a layer of top soil watered from artesian wells beneath the store. It was apparently created at the behest of Trevor Bowen, Vice-President of Barkers. Although Barkers had had some form of terrace gardens in 1921, Derry and Toms Roof Garden was one of the earliest roof gardens in England and it was planned to surpass all previous examples. The gardens were divided from the beginning into three types of garden: an English Woodland Garden, a Tudor Courtyard and a Spanish Garden. Various follies were erected, including a sun pavilion designed by Bernard George who supervised the gardens, with Ralph Handcock creating the landscaping and planting. The Spanish Garden had a Moorish pergola, the well of St Theresa and the Court of Fountains with raised beds along the wall. The Spanish convent bell tower was destroyed during the war. The Tudor Courtyard has a series of arches piercing a brick wall, covered with climbing plants. The English Woodland Garden had a series of pools with goldfish in them and trees planted around them. The gardens were opened in May 1938 by the Earl of Athlone and were a popular attraction. In the 1970s the store became home to the iconic Biba, and in 1982 it was purchased by Richard Branson of Virgin and the Gardens are now part of Virgin Limited Edition and host a members' club, a private function venue and, since 2001, the Babylon Restaurant on the 7th floor, which overlooks the gardens. The gardens have been extensively replanted in 2008/9. The Spanish garden is now planted in the style of the 1950s, The Tudor Courtyard Garden's scheme recalls the Biba style of the 1970s and the English Woodland Garden is now managed as a C21st environmental and wildlife garden. The gardens have been home to a selection of exotic wildfowl and in 2009 the resident pink flamingos, Bill and Ben, were joined by two new flamingos.